Can Boston CC claim the SLBL title this weekend? 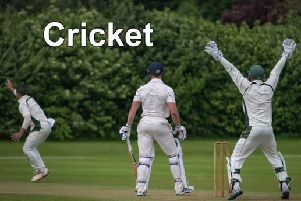 Boston Cricket Club’s First XI could claim the South Lincs and Border League Premier Division title when they host Long Sutton on Saturday. The Mayflower men didn’t have a game this weekend, but second-place Sleaford picked up 17 points against third-place Woodhall Spa. And that means that Tom Baxter’s side could wrap things up if they claim an 18-point victory. “We will do exactly as we have done so far this year, we will prepare right and look to pick up another victory,” Baxter said. Boston have picked up 18 points or more in their last 10 games, so will be hot favourites to pick up the league title on Saturday. Boston’s 18 points required are from three games but Baxter would like to have it wrapped up as soon as possible. Baxter will not play in the fixture as he remains injured, but bowler Scott Elleray will return. Reflecting on Boston’s victory at Long Sutton, the captain added: “At their place, it was probably our best bowling display, even though we didn’t bowl them out. “We limited Long Sutton to 103 runs from 45 overs. The Second XI are due to make the trip to Welby looking to further strengthen their bid on promotion. However, Welby’s last two fixtures have been conceded as they have been unable to raise a side. Another victory will push Boston one step closer to promotion and with Boston having only two games left, nothing short of two wins will be enough as local rivals, Freiston, Leake and Leverton are still very much in contention. The third XI picked up a much needed 20 points on Saturday without even putting on their whites. Graves Park, were unable to raise a side and Boston’s young Thirds were able to push closer to a top half finish this season. This weekend Boston Thrds are at home to Belton Park Seconds, another game that is crucial if Boston are to end the season in the top half of that division.